Rett Kendall recently argued and won a case before the South Carolina Supreme Court. The case involved a dispute over the “statute of repose” in construction liability cases involving sub-contractors responsible for only a portion of a larger project. 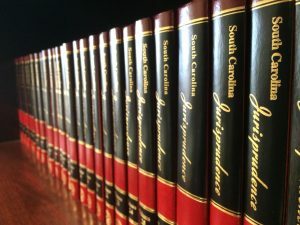 At issue was whether updates to the SC Code, stipulating that a building reached “substantial completion” for purposes of the statute of repose when a certificate of occupancy was issued, overruled the prior SC Supreme Court decision [Ocean Winds Corp. of Johns Island v. Lane, 347 S.C. 416, 418, 556 S.E.2d 377, 378 (2001)] which had held that “substantial completion” of portions of a building occurred when that phase of the project was completed, not when the whole building was completed and a certificate of occupancy was issued. This matter was of great consequence to our clients because if the Plaintiffs prevailed, it would mean that sub-contractors could face liability years after the statute of repose would otherwise have run on their portion of a larger project. Associate Tim Caiello wrote the brief arguing the Defense position on this certified question. Rett Kendall edited the final brief and argued the certified question before the South Carolina Supreme Court. The Court ruled entirely in our client’s favor, even using much of the language from the brief in their decision. This decision will provide important protections to sub-contractors going forward, and resolves a question of statutory construction important to the SC construction bar. J.R. Murphy argued a case in front of the South Carolina Supreme Court which concerned the subject of policy stacking. The question at issue was whether or not an insured can stack all household policies, which were written by 3 separate insurance companies, when he was injured while riding in a non-owned vehicle (a Class II situation). Murphy successfully persuaded the court to dismiss the writ of certiorari as improvidently granted, letting the lower court and court of appeals decisions in favor of the automobile insurer stand. Wesley Sawyer successfully argued for Judge Quattlebaum to deny Plaintiff’s motion to reconsider in an excluded driver case. The named insured signed a form naming his wife as an excluded driver. Later, she was involved in an accident while driving the insured vehicle. The named insured and his wife sought coverage under the policy and alleged the excluded driver from was invalid. South Carolina’s excluded driver statute requires the named insured to sign a form naming the excluded driver and declaring that either the excluded driver has turned his or her license in to the DMV or the excluded driver has other insurance. The named insured signed the form stating that his wife had turned her license in to the SC DMV. The plaintiffs argued this statement was incorrect because the wife had never had a license in the first place and this incorrect statement invalidated the exclusion. The District Court held South Carolina’s named driver exclusion statute was clear and unambiguous and applied the statute according to its terms. Because the statute only required the declaration from the named insured, the District Court found the insurer complied with the named driver exclusion statute and granted the insurer’s Motion for Judgment on the Pleadings finding the exclusion was valid and enforceable. Henry Deneen argued and won a Motion for Summary Judgment before Judge Sprouse in Anderson County Circuit Court in a declaratory action for a homeowners insurance carrier. Megan Walker authored much of the briefing and Order. The case involved an unlicensed/uninsured vehicle kept on the subject premises. The insured’s son was driving the subject vehicle on a public road when he was involved in a fatal accident that killed a passenger. J.R. Murphy argued a motion and obtained summary judgment for the property insurer of a golf course on a coastal island that sustained extensive damage from Hurricane Matthew. Wesley Sawyer briefed the issues and conducted much of the litigation. At issue was the validity of a specially negotiated, type-written special provision excluding coverage for wind, hail and flood damage to the golf courses. In June of 2018, Wes Sawyer earned summary judgment in U.S. District Court. The case involved a named driver exclusion. The named driver exclusion statute requires the named insured to sign an exclusion agreement stating that either the excluded driver’s license has been turned in to the DMV or the excluded person has other appropriate insurance. After an accident caused by the excluded driver, the insured claimed the exclusion was invalid because the excluded driver had never been licensed, so she had no license to “turn in” to the DMV. The presiding Judge held the statute must be applied according to its plain terms. Because the statute only requires that the named insured “declare” in the agreement that either the driver’s license had been turned in or the excluded person had other insurance, the named insured’s signature on the form making that declaration satisfied the statute’s requirement. J.R. Murphy obtained summary judgment in U.S. District court in a case involving lack of an insurable interest in an automobile insurance policy. The policy was taken out by a father, but insuring a vehicle owned by his adult, emancipated son, who was involved in a single vehicle accident. The court ruled that neither the liability nor UIM coverage were available to the injured passenger. In January 2018, John Grantland and Rogers Harrell received a defense verdict in the Kershaw County Court of Common Pleas. The case involved an intersection accident between the Plaintiff who was driving a Mercedes and Grantland’s client who was driving a tractor-trailer truck. Liability and proximate cause were hotly disputed. The Plaintiff blackboarded $286,000.00 in actual damages and claimed a life care plan of $1.3 Million. The Plaintiff’s demand before trial was $950,000, and Grantland offered $300,000.00 to settle. After a 6-day trial, the jury returned a defense verdict after deliberating approximately 30 minutes. J.R. Murphy obtained summary judgment in favor of the insurer in a case involving the cancellation and reinstatement of a personal auto policy after a fatal accident. In November 2017, the court ruled that the policy was not reinstated until the insured called the company and paid the premium over the phone, which admittedly occurred only after the named insured was aware that her daughter had been involved in a fatal accident operating a vehicle listed on the policy. The parties had entered into a stipulation prior to the filing of the declaratory judgment action to protect the insured from any personal exposure and avoid any Tyger River claim against the insurer. In August 2017, J.R. Murphy and Wes Sawyer received summary judgment. Judge Richard Gergel granted the client’s motion in a bad faith case involving underinsured motorist coverage. The insurer rejected a $5,000 demand shortly before trial, and the jury awarded $250,000 in damages. The insured had medical bills of about $10,000 and claimed $20,000 in lost wages. The plaintiff also claimed the accident cost him a career in the military. The insured recovered $25,000 from the liability carrier and about $25,000 from workers comp. Judge Gergel held as a matter of law that the provider’s dispute over the value of the case was not bad faith. Plaintiff is essentially alleging that the Easter Bunny’s mere presence in the store, and/or wave of the hand to Plaintiff as she walked toward the register, created a dangerous condition for which Defendant should be liable. If this was enough to constitute breach of a duty of care, Halloween costume stores ought to take caution nationwide. Fortunately for the costume industry, it is not, and both Halloween stores and organizers of the Macy’s Thanksgiving Day Parade can breathe a collective sigh of relief. In June 2017, the United States 4th Circuit Court of Appeals reversed a District Court Judge’s interpretation of case law commonly cited in automobile injury cases. At trial in Cramer v. National Casualty Co., the Judge held that “an insurer had to provide underinsured motorist coverage to an ambulance driver, even though she was standing across the road from the ambulance” when she was struck by a passing motorist. The lower court held that the driver was “occupying” the ambulance. J.R. Murphy argued the appeal and the 4th circuit reversed — denying that UIM applied. That ruling is consistent with several prior decisions Murphy obtained under similar facts. The case earned coverage in South Carolina Lawyers Weekly newspaper and Business Insurance magazine. Read the unpublished decision from the 4th Circuit. In June 2017, Rob Peele received a defense verdict in a Darlington County case: Richard Moore v. Dempsey Construction Company. The case involved claims by Mr. Moore that Dempsey Construction Company caused aesthetic and structural damage to his home when crews were building an access road adjacent to his property for a utility. The result of the three-day trial hinged on whether the use of the vibratory roller could have caused damage, and if so, how much in damages was Mr. Moore entitled to recover. After a roughly 90-minute deliberation, the jury returned a verdict for the defense. Shareholder Ray Moore, serving as local counsel, recently teamed up with Sean Keenan and Eric Schultz of Cruser & Mitchell, LLP in Atlanta. In April 2017, the legal team obtain summary judgment on behalf of their clients in a product liability case. The plaintiff alleged temporary paralysis and a substantial neck injury after he fell from an inversion table. That device had been subject of a voluntary Food and Drug Administration recall before the plaintiff’s injury. After removing the matter to federal court, Moore, Keenan and Schultz defended the case. Following two unsuccessful mediations the defense team moved for summary judgment, primarily on grounds that the plaintiff had failed to heed written warnings accompanying the device. Shortly before the case was subject to trial, United States District Judge C. Weston Houck granted summary judgment on all claims. J.R. Murphy received a verdict from Judge J. C. Nicholson, Jr., presiding judge for the 9th Judicial Circuit Court of South Carolina, who granted a motion for summary judgment in favor of the Defendant, Progressive Direct Insurance Company, in a case involving an assertion by the Plaintiff, Johnny L. Hedges, that the offer of underinsured motorist coverage made to him during an online transaction failed to satisfy the meaningful offer requirement imposed by South Carolina statute. Representing the Defendant, J.R. Murphy argued that the transaction did, in fact, satisfy the requirements, and the Court agreed. This ruling comes on the heels of a decision of the South Carolina Supreme Court in April 2016 in the matter of Traynum v. Scavens and Progressive Direct Insurance Company in which the Court upheld a trial court decision that the offer of optional coverage by electronic means during an online transaction is a legally binding offer. Murphy, who also argued for the Defense before both the Trial Court and the Supreme Court in the Traynum matter, sees this most recent ruling as both an extension and a validation of that which the court established in Traynum. Brent M. Boyd received a defense verdict for his client Queen’s Dozer Service, LLC in a construction defect case pending in York County, South Carolina entitled Marcy v. Pulte Home Corporation et al. This case involved claims by a homeowner against the general contractor, Pulte Home Corporation, and several of its subcontractors and a designer after the subject home experienced severe settlement and cracking. Queen’s Dozer, LLC served as one of the grading subcontractors on the project for Pulte Home Corporation. The case was submitted to arbitration, which lasted 8 days and involved 21 lay and expert witnesses. For details about Key Cases prior to 2016, click here. A result achieved on behalf of one client does not necessarily indicate similar results can be obtained for another.